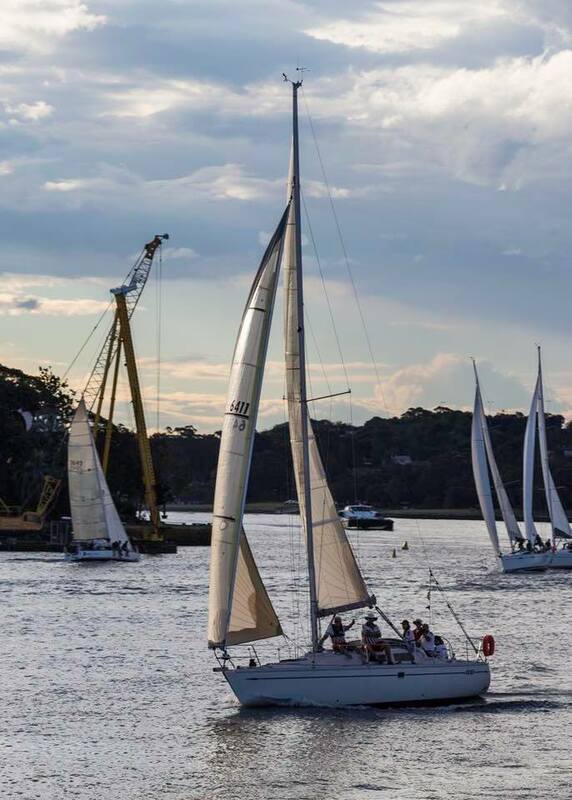 We had a typical Sydney summer thunder storm yesterday afternoon that could have put quite a dampener on the evening’s twilight race, which would have been a shame as last evening was our annual YOTs on Yachts twilight at GFS. YOTs (Youth Off The Streets) is a community organisation working for disadvantaged young people who may be homeless, drug dependent and/or recovering from abuse. Once a year we are visited by clients and staff from YOTS who join on a number of yachts to enjoy an evening sail. Fortunately the storm cleared and the evening was almost perfect, except for an almost, at times and places, a total lack of wind. G-whizz has developed a name for herself as being a pretty good performer in light air and last night she just added to that reputation. For once I was happy to only have 3 crew, Ann doing the duties on both head sail winches an Graham on the main, and assisting Ann when needed. I concentrated on getting the best start we could and was able to get into the leeward position on Starboard tack with about 30 seconds to go, this gave us control over the fleet and let us concentrate on position and not worry too much about other boats, although as can be expected there were a couple that needed reminding of our stand on position. We hit the line with good speed (as good as speed gets in lees than 5 knots of wind) right on the gun. Izzi passing the construction zone at Birchgrove. Twilight Dec 6, 2017. Photo Peter Miller. We were able to keep the fleet behind us on the run through Humbug, although I was always expecting that the wind might fill in a bit and bring them up onto us, this did not eventuate however Izzi was able to find something and passed us to windward as we were passing Greenwich Point. After getting around Greenwich Point Izzi and the rest of the fleet all decided to run pretty square trying to stay on the northern side of the Parramatta River and stay out of the tide. G- whizz does not like running square, especially without a pole to hold out the head sail, poling out is not really an option short crewed and we could see a bit of wind in the middle of the river, as we were in the first hour of the flooding tide we decided to run at bit of an angle, forget about the tide and see what the wind was like in the middle. This proved to be a good strategy as we were able to re-pass Izzi and accelerate away from then and the rest of the fleet. As we approached Berrys Bay we could see a North Easterly filling in and heading our way. This bit of pressure only lasted about 2 to 3 minutes but 12 knots on the beam gave us 8 knots of boat speed. To our benefit only a couple of the boats behind us were able to take advantage of it before it died down again. Concentrating on where the wind might be. Twilight Dec 6, 2017. Photo Peter Miller. Izzi (An indecently fast Northshore 380), Aurora (Hansi 400e) and Worlds Apart (Jeanneau 39i) all put their longer waterlines to good use and gave us bit of a fright on the run around the southern side of Goat Island. Graham reckoned that there was a bit of wind close in on the South Eastern point, logic would have said that there should be a big wind shadow there, so we took an early turn and too advantage of it. The reach in about 5 knots of wind back to Greenwich Point really suited us and we made more time on the fleet. Again logic dictates that there will be no wind in the lee of Greenwich Point, but both Ann and Graham insisted that there was some pressure in there, so I took a deep breath and went for it. This manoeuvre meant that we were able to pass a number of yachts from the earlier fleets and put us in a position that we only needed two tacks to get thorough Humbug. The finish was a bit exciting with 3 of us attacking the leeward pin, we able to “Shoot the mark” with the other 2 boats needing to pass head to wind, to make it, giving us the right of way. 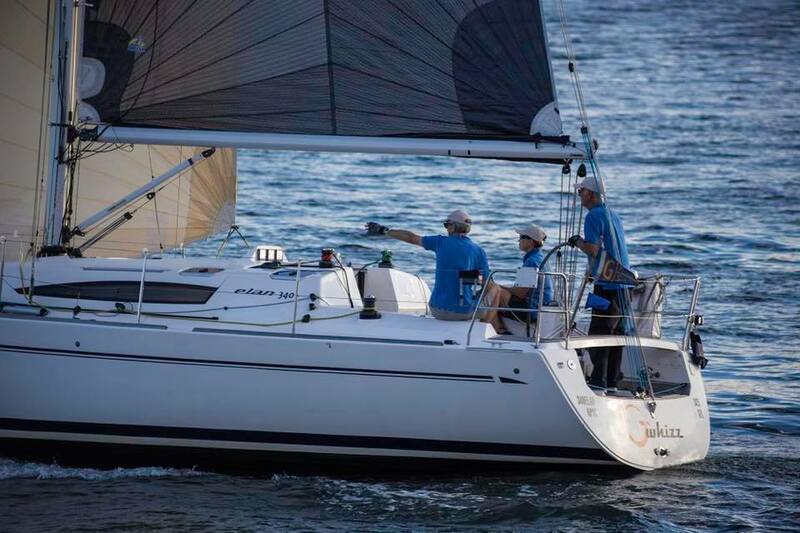 The result ~ A First on Scratch and a First on Handicap ~ was very satisfying, and once again highlighted the Elan 340’s abilities in light winds.